Oil Well Choke & Kill Manifold are a kind of well-control equipments, GN solids control do not produce such equipments, our products range including a complete set of solids control equipments and mud tanks. 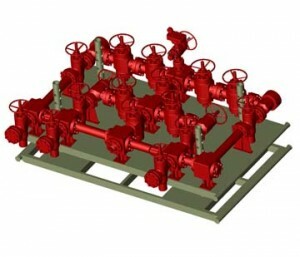 An arrangement of piping or valves designed to control, distribute and often monitor fluid flow. Manifolds are often configured for specific functions, such as a choke manifold used in well-control operations and a squeeze manifold used in squeeze-cementing work. In each case, the functional requirements of the operation have been addressed in the configuration of the manifold and the degree of control and instrumentation required. Oil well choke manifold is high-pressure pipe leading from an outlet on the BOP stack to the backpressure choke and associated manifold. During well-control operations, the fluid under pressure in the wellbore flows out of the well through the choke line to the choke, reducing the fluid pressure to atmospheric pressure. In floating offshore operations, the choke and kill lines exit the subsea BOP stack and then run along the outside of the drilling riser to the surface. A choke manifold is used to lower the pressure from the well head. It consists of a set of high pressure valves and at least two chokes. These chokes can be fixed or adjustable or a mix of both. The redundancy is needed so that if one choke has to be taken out of service, the flow can be directed through another one. these long choke and kill lines must be considered to control the well properly. Kill manifold is necessary equipment in well-control system to pump drilling fluid into well barrel or inject the water into wellhead. It consists of check valves, gate valves, pressure gauges and line pipe. Although we are not manufacturer, we can recommend good suppliers in China, pls contact us if you require solids control equipments. We require Choke Manifold on competetive basis. Earlieast reply will be highly appreciated. hello, i serching for 3 choke manifold 2″ x 2″ , 4valves, need a quote..